What about crêpes? It is easy to improvise! Ideally, let the preparation rest for 2 hours before frying. * If you don't know what to do with the leftover egg whites, click here. Put the flour in a salad bowl. Add the eggs, the sugar, the salt and then the milk little by little until you have a good consistency (it must not be too liquid). The milk quantity I indicated is not compulsory (it's rather to make sure that you have enough, but I never use it all). Add the melted butter; stir well and let it rest for 2 hours. 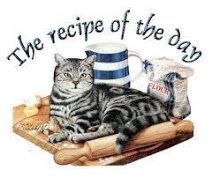 If the preparation has thickened too much, add some more milk. You can also make salted crêpes: fill them with ham, an egg and some grated cheese. 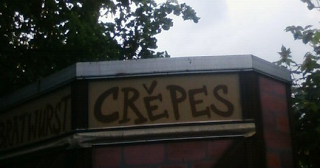 Something funny: When I am outside of France, I always check the "crêpes shops". They can never put the right accent, that is, ^. For example, in Germany... Come on, you are almost correct!